The deliveries of the 2019 Dominar 400 have commenced, as seen in these images captured at Kanchan Bajaj (Thane). The motorcycle, as reported earlier, has been priced at INR 1,73,870 (ex-showroom). The dealership delivered the bike in both new colour options – green and matte black. 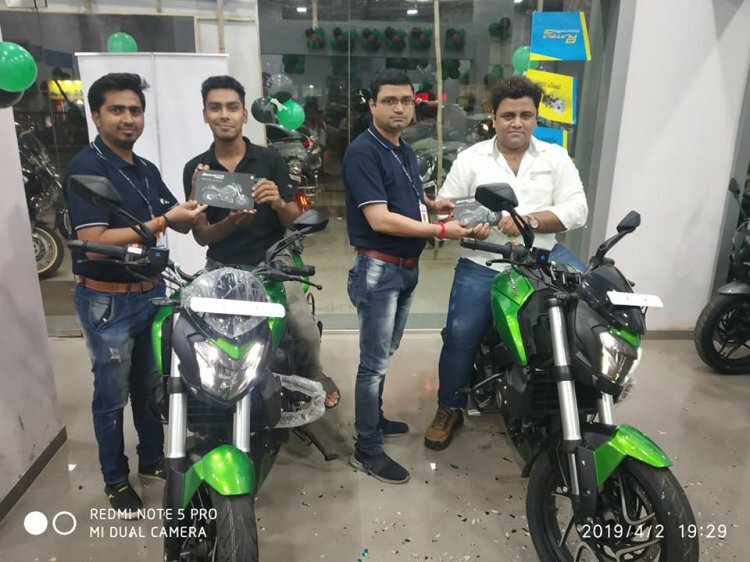 The 2019 Bajaj Dominar seen in the images were delivered to their respective owners by Kanchan Bajaj, a Thane dealership. The 2019 Bajaj Dominar 400 is a significant step up over its predecessor. However, despite the premium hardware on the upgraded model, the 2019 iteration carries a premium of just INR 10,795 over its predecessor. The vehicles reserved for the media ride were only available in the green paint option. However, earlier this week, we spotted the 2019 model in matte black colour at a warehouse near Mumbai. Bajaj Auto has limited the colour option to just two for now, but it could extend the palette depending on the demand. The 2019 Bajaj Dominar 400 comes with upside-down telescopic forks that give it a beefier look. The CS400 concept, which was showcased at the 2014 Auto Expo, was equipped with a similar setup. However, the first generation model received conventional forks to keep prices competitive and battle against the Royal Enfield 350 range of bikes. The rear continues to feature an adjustable monoshock. Feature list continues to include full-LED lighting, but Bajaj has revised the internals of the headlamp and tail light for better performance. Other features include a split-style instrument console – a feature showcased on the CS400 concept in 2014 - to offer an uncluttered view of the information. Mechanical specifications continue to include 373.2 cc, single-cylinder, liquid-cooled motor with three spark plugs. However, the 2019 model comes with a dual overhead camshaft that gets it one step closer to the BS-VI compliance. The engine now makes at 40 PS (+5 PS) at 8,650 rpm and 35 Nm of peak torque at 7,000 rpm. The bump in performance has increased the top speed to 156 km/h (Vs 148 km/h). Bajaj is currently offering the 2019 Dominar 400 in two colour options - green and matte black. The company could extend the palette depending on the demand. The new Dominar 400 rivals the likes of TVS Apache RR310, BMW G 310 R, Honda CB300R and the KTM 390 Duke. With a sub-INR 2 lakh (ex-showroom) price tag, it is the most value-for-money motorcycle in its segment.